While there is some debate about who originally said this and why, there is no doubting the fact that your eyes really can reveal a lot about you, specifically your present state of health. While ophthalmologists spend thousands of dollars and many years learning about the many intricacies of the eyes and vision in general, there are some things your eyes can divulge that don’t require an expensive degree. If you have ever had stye, you know how painful and irritating it can be, especially if it is a common occurrence. While the condition, which is characterized by a bump that forms on your eyelid due to a blocked sebaceous gland, typically only lasts a few days, it can persist for months (1). If you experience a stubborn stye, it may be much more than a painful inconvenience. It could actually be a sign of something more sinister—a rare form of cancer known as sebaceous gland carcinoma (2). So, if you have a long-lasting stye, or even a stye that occurs regularly in the same location, it is probably time to see your doctor. There are several reasons why you might experience thinning eyebrow hair, including aging, stress, and a nutritional deficiency. It may also be a result of a condition known as alopecia areata, or spot baldness, although unlikely since this only affects about 0.1 percent of the population (3). One more likely reason for hair loss in this area, however, is thyroid disease (4). Hypothyroidism can cause the body to slow down. It also messes with various hormones and can lead to general hair loss. If you are experiencing thinning eyebrows, it is worth a talk with your doctor to rule out thyroid issues. These days so many jobs require countless hours on the computer. And those of us that spend countless hours staring at a bright computer screen can ultimately end up experiencing burning eyes or blurry vision. While the digital age may have put us miles ahead in some areas, when it comes to our vision, it may be doing more harm than good. In fact, the situation is so common, it is now called “Digital Eye Strain” and is described as a group of eye and vision-related problems that result from prolonged computer, tablet, e-reader, and cell phone use (5). If you find you are suffering from this condition you should speak to your doctor to discuss ways you can mitigate the situation. If you have ever experienced a small blind spot in your vision, it can be quite scary. But this situation can also indicate that you are experiencing a migraine aura, especially is you also see shimmering lights or a wavy line. This blind spot and lights may be followed by a painful headache (6). If this happens a lot, you can speak to your doctor about ways to deal with the symptoms and even look to possible triggers so you can avoid them. We have all had times when you think your eyes are playing tricks on you. You rub your eyes or blink several times and things seem to clear. But if you feel a consistent bulging sensation in your eyes, it may again be related to your thyroid. In fact, one of the most common causes of protruding eyes is associated with hyperthyroidism, a condition in which your thyroid is too active. Also knowns as Grave’s Disease, this autoimmune disorder causes your thyroid gland to create too much thyroid hormone. One symptom, called Graves’ ophthalmopathy, occurs when your eyes appear enlarged when your eyelids retract, causing your eyes to bulge from your eye sockets (7). 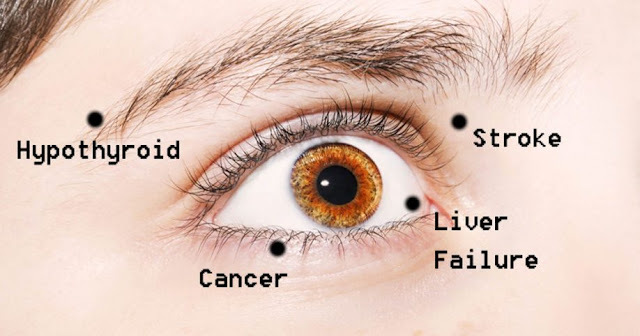 According to the National Institute of Diabetes and Digestive and Kidney Diseases, up to 30 percent of people that develop Graves’ disease will get a mild case of Graves’ ophthalmopathy. And up to 5 percent will experience a severe case (8). So if your eyes feel like they are bugging out, speak to your doctor. This condition is very noticeable, so if you experience it, you will know right away. While it can take time for the condition to worsen, it can also appear quickly in cases of newborns, for example. Jaundice, the term used to describe a yellowing of your eye whites and skin, can occur in newborns who have an underdeveloped liver function but adults can also experience this condition, which is a sure sign you are experiencing some type of liver problem. It can also be related to your gallbladder or bile duct, so if you find your eyes are yellowing, speak to your doctor immediately (9). There are many health issues you need to be concerned about when you are diagnosed with diabetes. Diabetics are at an increased risk for a number of eye problems, including a condition called Diabetic Retinopathy. Diabetic Retinopathy is caused by damage to the blood vessels in the light-sensitive tissue at the back of your eye (retina). It further affects the blood vessels in your eye and is actually the primary cause of blindness in American adults (10). This is not a condition you should take lightly, so if you have diabetes, speak to your doctor right away if you are experiencing any blurred vision. Anytime you experience vision changes, it can be alarming. Our eyes are vital to us. So any sudden double vision, dim vision or loss of vision at all means you should see your doctor right away. If you are seeing double, dimly lit objects or losing your vision altogether, contact a health care professional immediately. as these symptoms can all be warning signs of a stroke (11).